The aim of a brow lift is to position the brow in a more proportional position to the general overall facial contour and facial features. The aim of a brow lift is to position the brow in a more proportional position to the general overall facial contour and facial features. In addition, as well as elevating the forehead and smoothing out wrinkles of the forehead there can also be some correction of the wrinkles between the eyebrows. These include Dr Belt’s fee, an assistant’s fee, the theatre fee, day fee and an anaesthetist fee. These can be broken down into both general and specific. The specific risks for a brow lift include reduced or loss of sensation to the top of the forehead and the scalp. With time this numbness may be replaced by a strange sensation of itching but gradually resolves within a period of a few weeks to months as the nerves heal. Very rarely some permanent injury to the nerves that move the eyebrows can result in some permanent asymmetry of the eyebrows. On rare occasions the eyes may become swollen and bruised to such a degree that the eyes can't open fully. This is only temporary and settles as the swelling resolves. Deep wrinkles may fail to be completely improved and very rarely no benefit may be seen. The endoscopic technique tends to reduce the potential risk of raising the hairline. Very rarely temporary hair loss may occur (alopecia) near the treated area particularly around the areas of the scar. Occasionally the results of surgery may not meet expectations and revisional procedures may occasionally be required. General risks include bruising, swelling, wound infection, anaesthetic related problems, bleeding and abnormal scarring including hypertrophic and keloid scarring. Endoscopic or keyhole surgery where 3-5 short incisions in the hair bearing scalp allow instrumentation of the forehead to be performed. This is assisted by a video camera being placed through these incisions. A more traditional technique would involve an open incision across the top of the scalp. 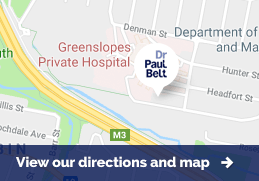 Dr Belt recommends that this type of surgery should only be performed under General Anaesthetic administered by a specialist consultant anaesthetist.